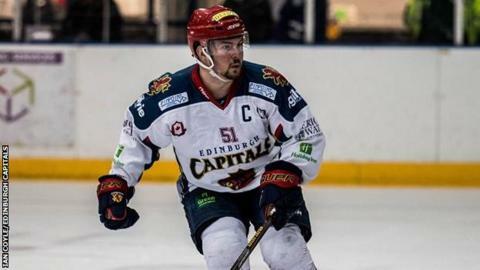 Edinburgh Capitals captain Mike D'Orazio insists he and his team-mates are focused solely on doing their job on the ice after recent rumours of financial trouble. The Caps were the subject of chatter online that the club were to go out of business, but it's been business as usual with the Murrayfield men losing twice to Fife Flyers at the weekend. And D'Orazio says they can't afford to let the recent gossip affect them, but has called for changes as they remain bottom of the Elite League table. "We hear all the rumours, like everyone else has, but the team's still around and we're still employed by them," D'Orazio said. "Our job is to go out there and play. Once you start worrying about things off the ice, it can leak into your game. Our mentality is on the task at hand and what we have to do. "We need to make some changes and bring some guys in. We've won two in the last so many games, which isn't good enough, but two wins from our last five sounds better." While it was a another disappointing weekend for the Caps, it was a good one for the Flyers, who moved to the top of the Gardiner Conference following their double success. Saturday's game in Kirkcaldy saw Todd Dutiaume's side win 6-2, a result that never looked in doubt as Carlo Finucci, Danick Gauthier and Shayne Stockton fired them three up. Nikita Kolesnikovs pulled one back for Edinburgh and although Stockton responded with another for Fife, Kolesnikovs struck again to reduce the deficit to two. Fife kicked on in the third as Gauthier picked up his second, followed by Evan Bloodoff wrapping things up late on with their sixth. Both sides then headed across the Forth to Edinburgh for the rematch, but it was Fife again who were on top form, winning 5-1 at Murrayfield. Finucci struck the first of a hat-trick to put them in front, but D'Orazio wiped it out with an equaliser before Charlie Mosey restored the lead. The visitors kicked on in the final period as Finucci hit two more to complete his treble with Liam Heelis adding another for good measure. Dundee Stars' run of losses was extended to six after two away trips yielded no points for Omar Pacha's men. Saturday's journey to Guildford Flames saw them go down 7-3 at The Spectrum, with Ben Davies hitting two and Calle Ackered adding a third to get the home side on their way. Malcolm Gould pulled one back, but Ian Watters restored Guildford's three goal lead, only for Jimmy Jensen to get on the board for the Stars. Kruise Reddick all but secured the points for Flames and despite Gabriel Levesque got another for Stars, Rhett Rachinski and Brett Ferguson rounded things off. Dundee headed to Cardiff Devils on Sunday looking to salvage something from the weekend and although they made a better fist of it, a 3-2 loss was all they had to show for it. The home side went two up through Layne Ulmer and Andrew Hotham before Brian Hart pegged one back for the Stars on the powerplay. Joey Haddad made it 3-1 and despite Joey de Concilys grabbing one to close the gap to one in the final stages, it was all they could muster. While Dundee spent the weekend on their travels, Braehead Clan stayed at home and got a mixed outcome. Saturday's 3-1 win over Coventry Blaze made it five wins in a row despite Marc-Olivier Vallerand opened the scoring for the visitors. Adam Brace, scoring on his comeback from injury, drew Clan level, with goals from Ryan Potulny and Ville Hämäläinen completing a good night's work. However, that run came to an end as Nottingham Panthers shutout the Clan on home ice in Sunday's game, taking the points in a 3-0 win. It was a much tighter game than the scoreline suggested, but Panthers did enough as Alexander Mokshantsev, Robert Lachowicz and Jeff Brown secured the win in Glasgow.